So. I’m sitting on a plane (not while I post this, I might add – even if someone had the presence of mind to set up a wifi hotspot over the entire Pacific ocean I’m limited by the fact that radio waves make planes fall out of the sky), heading towards possibly the most daunting experience I could imagine. 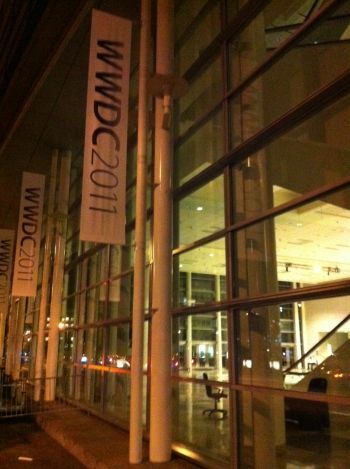 I am going to the Apple “World Wide Developer Conference”. Apparently I didn’t have enough of a reason to go to E3 (disappointing! ), so work has packed me up and sent me off to keep abreast of the developments in the Cult of Jobs. This post serves to document the man I was – just incase they manage to get their claws into me during the biggest brainwashing event of the year. I’ve already left myself a video message which hopefully will point me in the right direction should I suddenly get the urge to wear turtlenecks and tight, tight jeans. I have to say, I was much more excited about going to GDC. I still am enough of a kid to get excited at the prospect of flying on a plane. I mean, how couldn’t you? You get to eat some weird food on a tray, people will rub swabs all over you to have a machine tell you that you smell of explosives, and you get to be put in extremely close proximity to someone who you don’t know and almost certainly won’t like for hours and hours. This particular trip does have some bonuses, however – as it’s not just for education but is actually “work”, I get to fly premium enonomy (the games industry hasn’t been able to afford business class since the GFC), something which I have been pining for since work first sent me to the US. From the almost reasonable legroom to the Champagne (well, sparkling wine – it’s not first class after all) you get when you board. You know, they actually even know your name. But, I am getting waaay ahead of myself. The story starts in the gate lounge of Melbourne Airport. I had only an hour and a half ago hugged my partner goodbye (she was asleep, any more than that is probably illegal), and already I had begun to notice an almost unreasonable number of Apple Macbooks. Actually, any number of Macbooks is unreasonable – it’s a depressing reminder of just how gullible we are as a species. Not to mention that everyone with a Macbook (at least, at that time), had a certain… well, look about them. Maybe we could describe it as some form of ur-hipster. All of them had obviously spent at least an hour and a half on their hair and probably would describe themselves as “bi-curious”. After a while, one of them said to another group (I wonder what the collective noun for Mac users is? I’ll go with “bromance”) of them: “are you guys going to WWDC too?” The question dripped with – well, something that should never have gone past passport control. I sensed a general rumbling while everyone turned to the speaker, at which point, the entire bromance replied in the affirmative. One of the ringleaders quipped “you can always spot a cocoa developer!” Yes. Yes you can. It hasn’t been premium all the way (I did have to mix with the proletariat, quel horreur as David Gaider would say) – and in my quest to discover the best airline (and to avoid Los Angeles airport, which is possibly the only major transit hub owned and operated by Satan himself), I’ve gone the roundabout route of going via New zealand. Via Air New Zealand, in fact. To be honest, I was expecting better (Singapore Airlines is still the king), but it’s at least better than Qantas, where they actively seek to harm you during your flight. I’ll be writing up some delicious reviews in the future, as I think they firmly sit in the “hate” section of my blog title. But that is for another time. Now, it is time for me to crash in this rather nice hotel, and steel myself for the coming week.